On message, English National Ballet has fashioned an evening of dance celebrating the female choreographer. She Said brings together Annabelle Lopez Ochoa and Aszure Barton from North America and Yabin Wang from China to each create a work for the company. She Said does not set out to compare their works with the male-dominated canon (reflected in its many iconographic forms in Grayson Perry’s delightful mandala-like front cloth) but to respond to the current criticism that we don’t hear enough of the female choreographic voice in contemporary classical work. One can’t argue with that, and even if the qualities of that voice resist clear identification, the experience of watching the three works in She Said is decidedly refreshing. Along with news that English National Ballet has been granted permission by Tanztheater Wuppertal Pina Bausch to perform Bausch’s Rite of Spring, it seems the initiatives of artistic director Tamara Rojo have an uncanny ability to fill unwarranted gaps in the repertoire while keeping an astute eye on public relations. The profile of the company keeps growing. Given She Said invokes the gender question, it is perhaps worth noting not all the creative input is female. Lopez Ochoa and Barton both use scores by male composers (Peter Salem and Mason Bates respectively) and Wang seems to have been handed an entire Akram Khan creative toolkit that includes music by Jocelyn Pook, costume design by Kimie Nakano, lighting design by Fabiana Piccioli and video projection by Matt Deely. Given the role of Farooq Chaudhry — co-founder and producer of Akram Khan Company — as creative producer at ENB one can trace a male influence in the choice of Wang’s collaborative team. This might have gone unnoticed but for an overwhelming sense that Pook’s score drowns Wang’s version of the Greek tragedy of Medea, M-Dao. Wang’s approach to Medea is not so much by way of the western notion of fate as through a particularly Eastern sensibility of emotional detachment. Pook misses this subtlety, so M-Dao relies for its effectiveness on its visual construction. Erina Takahashi as Medea is an ideal interpreter for Wang and her articulate, fragile opening solo, one foot in a pale blue pointe shoe the other bare, suggests the enigma of Medea’s character. Because the gestural appearance of James Streeter as Jason and Lauretta Summerscales as his new wife Glauce lack this sense of detachment, their narrative separates naturally from Medea’s and leaves the focus on her. Wang’s understated choreography signifies the drama without getting involved in its outward emotion and she is helped in this by Nakane’s sensibility in set design and Piccioli’s lighting. Deely’s video tends to state rather too much, as if he is afraid Wang’s imagery is not enough, but it is Pook’s fleshy, middle-eastern mix of a score that simply overrides the quiet articulation of Wang’s choreography; we can barely see for hearing. The opening work, Lopez Ochoa’s Broken Wings, is based on the life and love of Mexican painter, Frida Kahlo. Lopez Ochoa remembers Rojo giving her a list of female figures in history and literature from which to choose a subject, but she kept coming back to Kahlo. Spanish culture is a bond between choreographer and director/interpreter, and Kahlo provides Rojo with a role for which she has an affinity. She is most effective at the beginning as a young, spirited girl playing with the Day of the Dead skeletons; her sense of fun and self-confidence is palpable. Kahlo’s adolescent life was brutally interrupted by a tram accident that left her an invalid but Lopez Ochoa gives Rojo’s transformation a soft balletic treatment — a turned-in, shaking leg that she clutches but which can nevertheless reach 190 degrees behind her when called for — without the tormented, emotional dimension that gave rise to Kahlo’s creativity. 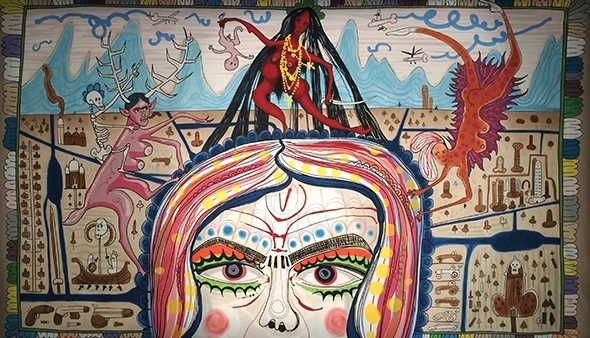 Lopez Ochoa uses the visual symbolism of Dieuweke van Reij’s set design to suggest Kahlo’s flights of imagination as well as a corps of male dancers (a lovely inversion) dressed and brilliantly painted (by Dominic Skinner) as Kahlo’s feminine spirits. Broken Wings also provides a wonderful role for Irek Mukhamedov as the painter Diego Rivera. His passionate on-again-off-again relationship with Kahlo is the stuff of legend, and Mukhamedov fills those legendary shoes with weighty, captivating flair. Mukhamedov is also the company’s principal ballet master, and some of the credit must go to him for the outstanding level of technique evident in the last work, Barton’s Fantastic Beings. Of all the voices this evening, Barton’s is the one I hear most clearly: someone who is confident of what she can coax from the dancers, skilled in putting it together with subtle and witty imagery (enhanced by Burke Brown’s lighting and Michelle Jank’s costumes), and assured in making the music an equal partner to the choreography. This latter aspect is perhaps the only weakness: the length of Fantastic Beings is dictated by Bates’ existing score, which draws out Barton’s wealth of invention beyond its choreographic endpoint. Nevertheless, the technical demands Barton brings out of the dancers are inspired and in turn the dancers — particularly Isaac Hernandez — respond with a precision, clarity and imagination that is thrilling to see. Fantastic beings indeed. The three modern masters represented in English National Ballet (ENB)’s triple bill at Sadler’s Wells — Jiří Kylián, John Neumeier and William Forsythe — are all related in that they learned their trade in John Cranko’s Stuttgart Ballet before forging their own distinctive styles of classical dance in their respective companies: Kylián in The Hague, Neumeier in Hamburg and Forsythe in Frankfurt. The three works performed this evening are like cousins, having their beginnings in a rich artistic period in Europe within two years of the fall of the Berlin Wall and have since been staged by companies around the world. What a welcome relief to see Alejandro Virelles and Cesar Corrales in the first act of Neumeier’s Spring and Fall, choreographed to the five movements of Antonin Dvořák’s Serenade in E major. Here are two male dancers whose physique appears to be formed by classical training alone; they both move effortlessly and quietly from the inside, which is a totally different approach from the gym-enhanced school. With its pastel colours and white costumes (Neumeier’s own conception) the setting of Spring and Fall suggests a happy, youthful memory in which an ardent Virelles and a flirtatious but spirited Alina Cojocaru express their burgeoning love against a chorus of friends. Virelles and Cojocaru are beautifully matched in their ease of technique and lack of pretence that comes from the mastery of their art. The choreography is abstract but it is not hard to read. As Neumeier says, ‘As soon as there are two people there is some kind of relationship. And those human relationships are what interest me as a choreographer.’ Apart from the three principals, the supporting cast prove a little ragged, but Anjuli Hudson stands out with her uninhibited enthusiasm. Forsythe’s In the Middle, Somewhat Elevated was first choreographed on the Paris Opéra Ballet in 1987 when Rudolph Nureyev was artistic director. Forsythe remembers ‘the whole atmosphere there was electric.’ The first cast included a young Sylvie Guillem, Laurent Hilaire, Isabelle Guérin and Manuel Legris. Imagine those long legs arriving at the height of a percussive climax in Thom Willems’ electronic score and what Forsythe’s elongated, dynamic, off-balance shapes must have looked like. There is also a chic cool in the way the dancers wander in and start their variations, something the French do so well. It is still a thrilling dance to watch with its spatial dynamics and visceral physicality, though Wednesday’s cast is less tall, less elongated than its ideal execution demands: the dynamics of the steps don’t quite match the dynamics of the score. In terms of coolness, Tiffany Hedman seems to have the measure of the work but the same can’t be said about James Streeter, fresh from fencing, who mistakes open-mouthed, brazen posing for cool assurance. It’s that bodybuilding thing again. 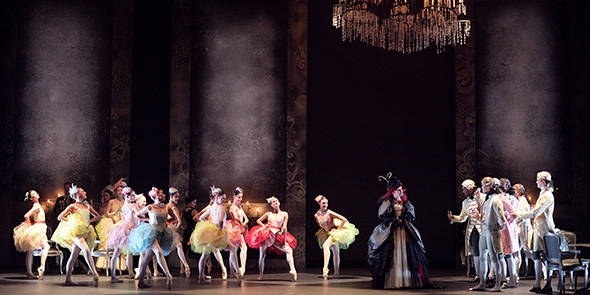 English National Ballet has an enterprising Learning program that encourages the public to engage in ballet through various interactive projects. This time last year I was drawn to their Dance in Focus, an opportunity to develop dance photography under the guidance of Chris Nash, and recently I joined their stimulating Dance is the Word workshop on critical dance writing with Donald Hutera. It was structured around ENB’s Emerging Dancer 2013, a platform that encourages promising artists within the company to step up to a new level. Each year six dancers — thee men and three women up to the rank of soloist (this year they are all Artists of the Company) — are chosen to prepare for this privilege on top of their demanding touring schedule. Unlike last year, where dancers were judged on two solos, the 2013 competition is based on a solo and a pas de deux, a framework that allows both individual expression and fine-tuning with a partner. We watch the dancers in company class in the Festival Hall’s Clore Ballroom and later in dress rehearsal on stage in the Queen Elizabeth Hall. Neither of these preparatory processes is designed for public observation; they are places for each dancer to iron out technical, spatial, costume or lighting problems under the aegis of company teachers and directors, so the presence of even a small number of spectators can have an ambivalent effect on the artists. It is the performance on which the dancers are judged, after all, and that is the moment for which they summon all their powers. It is the nature of competition to single out a winner and Nancy Osbaldeston rose to the challenge to carry off this year’s prize. John Neumeier’s fluid solo Bach Suite No. 2 is a perfect vehicle for her radiant turns and effortless ballon and in the pas de deux from Don Quixote with Ken Saruhashi she replaces Kitri’s dark vein of passion with her naturally bright ebullience. Osbaldeston doesn’t have the classical lines of Laurretta Summerscales or Alison McWhinney, but she has a star quality that makes her shine in whatever she does. The award is made on the night by a jury of five (Tamara Rojo, Darcey Bussell, Luke Jennings, Tommy Franzén and Jude Kelly), but an additional prize is the result of audience votes over the previous season. In 2012 the jury and the public concurred, but this year’s People’s Choice recognized the qualities of Summerscales, whose wit and intelligence and swan-like ability to reveal beauty without any apparent effort are the mark of a great artist. For her solo, she danced the Calliope Rag from Sir Kenneth MacMillan’s Élite Syncopations; she could have brought out a more unctuously flirtatious quality, but her musicality and sense of fun were evident. My heart went out to McWhinney, whose ethereal tenderness in Giselle — she will save many a young man from an early death and will make them all eternally repentant — and her lovely line and poise in Victor Gsovsky’s Grand Pas Classique are a joy to watch. It is fitting in the year Tamara Rojo becomes artistic director that the women feature so strongly in this competition. In a sense they have already emerged, showing a mature self-awareness in their choice of solo to complement their pas de deux. The men are not quite so astute: Saruhashi and Nathan Young choose solos that challenge their technical skills but that do little to enhance their stage presence, while Guilherme Menezes, whose enthusiasm and innocence draw us naturally into his confidence, has the right idea — a loose, clown-like solo by Nicky Ellis to contrast with the Black Swan pas de deux — but the choreography is not well enough developed to fully reveal his energies and qualities. Saruhashi has prodigious technical ability but wears his emotions close to the skin, giving an impeccable if somewhat inscrutable rendering of Don Quixote and unwinding only slightly in the all-too-brief Patrice Bart solo, Verdiana. Nathan Young gives full play to his romantic spirit and partnering ability in Giselle, but his style in Bournonville’s Napoli variation is too muscular to bring out the Danish charm and buoyancy. It is worth noting that Osbaldeston and Summerscales were finalists in 2011 and 2012 respectively; it will be interesting to see which of this year’s three men will emerge in 2014.